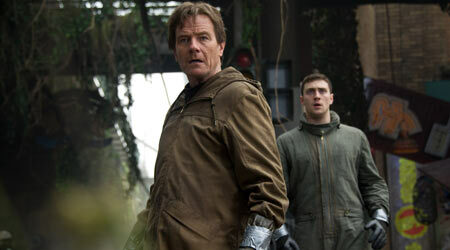 Lieutenant Ford Brody (Aaron Taylor-Johnson) and his father Joe (Bryan Cranston) discover that the Japanese military is hiding a giant monster, which is about to break loose… The second Hollywood adaptation is realistic, surprisingly consistent, entertaining, loud and in 3D. Many years after his mother Sandra (Juliette Binoche) has died in a supposed accident in a Japanese nuclear plant, Ford Brody (Aaron Taylor-Johnson) is grown up and has a child of his own with his wife Elle (Elizabeth Olsen). Ford has just returned from an international deployment for the US military, when his father Joe (Bryan Cranston) is seized by Japanese police. Therefore Ford travels to his father immediately. As the most prominent kaiju, i.e. monster, Godzilla has appeared in 28 films sind 1954: in Japanese suitmotion and stop-motion as well as in Roland Emmerich's horrible Hollywood interpretation from 1998. 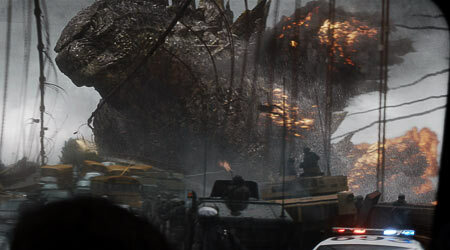 10 years after the last Godzilla movie, the 29th installment of the loose series hits cinemas in May 2014 - again from Hollywood. As one could already learn from the trailer, this one banks on modern computer-generated realism. Where the trailer appeared trashy and sometimes illogical, the entire 3D movie "Godzilla" by Gareth Edwards (just the right man after his indie success "Monsters") is surprisingly exciting and consistent. Director Edwards, the authors and effects teams have sought close proximity to the Japanese origin (and its design of the monster), and they also moved a considerable part of the plot to Japan (or Japanese temples in San Francisco)—presumably to also satisfy Asian fans. But the film does not only score with more diverse settings as Emmerich's version (Japan, Hawaii, SF, Nevada), but also with more monsters in addition to Godzilla, so that they fight each other. 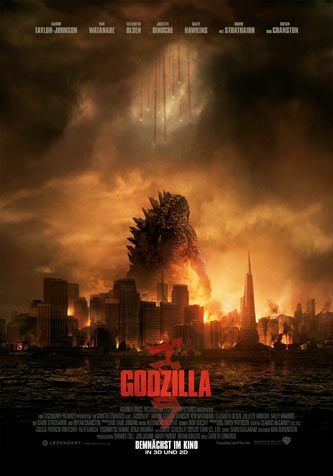 Another plus—and that much can be revealed: Godzilla is not completely demonized in the version of 2014 unlike Emmerich's flick. There are some weak dialogues or akward acting moments, but the talented cast (Ken Watanabe, Sally Hawkins, David Strathairn) can convince in the main. The actors bring in humaneness, when the interpersonal situations are becoming stereotypical in the usual action-heavy manner. But throughout, the focus is less on the monsters and more on the human destinies—admittedly with drama, but fortunately little pathos. In fact, the filmmakers allow time to gradually bring the monsters into action. They don't shoot all their bolts right in the beginning, thus offering the viewer something interesting until the very end. Some might be disappointed, however, that the titular kaiju isn't that much in focus. I didn't mind. Although much is presented in more realistic and serious tone than in any previous Godzilla movie, some fun is inevitable. Especially towards the end it gets a bit more trashy—fortunately. Really impressive throughout (and Oscar worthy) are the digital effects and the sound design. 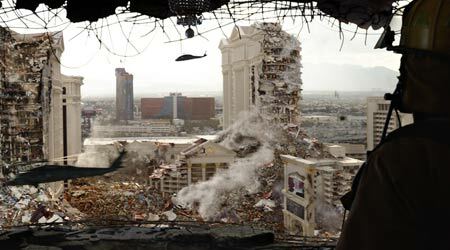 The fighting kaijus and their destruction seem not at all exaggerated, but almost necessary. Maybe some may be irked by the design of the MUTOs (the other creatures), but Godzilla looks original, authentic and scary, although surprisingly stout. And yes, Godzilla is loud! The walls of the cinema hall, where the press screening took place, were shaking. 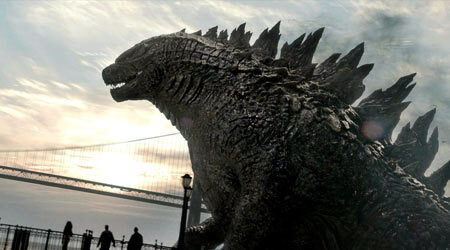 Atmospheric images and impressive sound make "Godzilla" a huge spectacle that cannot really be recreated at home. That's why it's worth going to a movie theater with outstanding technical equipment. Then you might experience something similar to first seeing "Jurassic Park" and its T-Rex on the big screen.